The single biggest factor in vehicle safety isn’t the latest technology, air bags, electronics or driver skill - it’s the driver’s vision. DuPont™ Wiper Blades help you outsmart Mother Nature's toughest elements. The ability to see clearly when driving is a fundamental aspect of vehicle safety. And these blades give you the clear vision you need where a split second can make a difference. 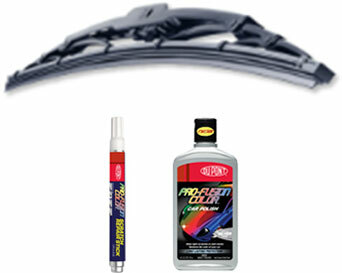 Make DuPont™ Wiper Blades your choice to wipe away the toughest weather. DuPont™ Pro-Fusion products are safe for use on all vehicles to keep them looking shiny and new. The DuPont™ Pro-Fusion Color™ Scratch Repair Stick is an instant finish fixer that fills in scratches in the clear coat finish and DuPont™ Pro-Fusion Color™ Car Polish is an advanced formulation that fills in light scratches and swirl marks in your vehicle's finish. Select the product that will work best for your needed application.